In keeping with my blog’s theme of sharing all sorts of personal details related to my triathlon adventures, it’s high time that I got around to finances. I must admit that I felt a bit shy about tackling this topic. I’ll tell you all about my hormones, body composition, mental weaknesses and more, but money almost feels taboo. 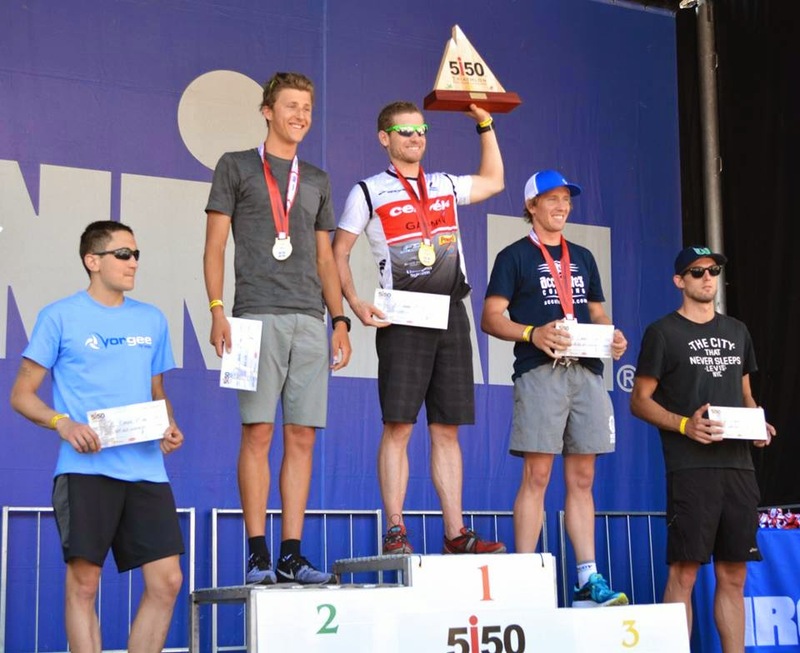 Like most professionals, pro triathletes tend to be tight-lipped on this topic. 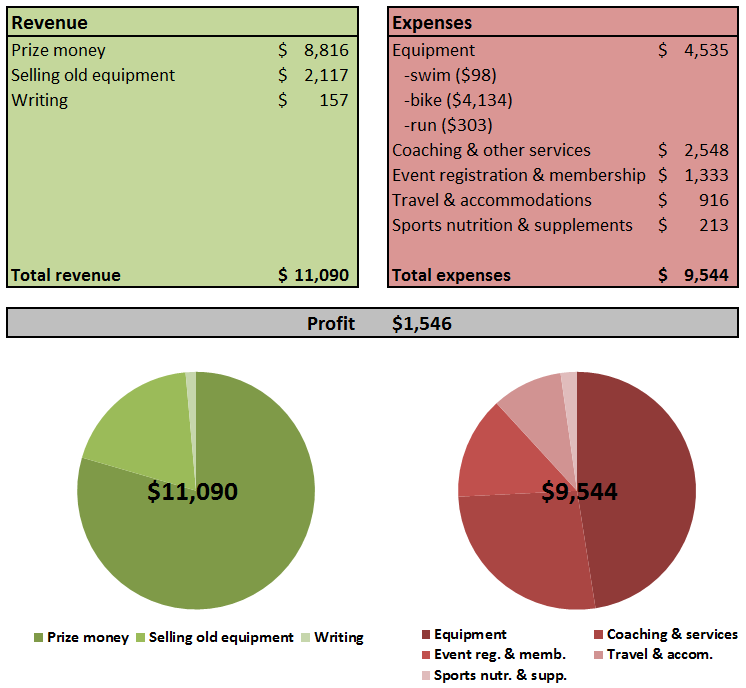 In this post, I’ll provide a brutally honest breakdown of my budget from my 2014 rookie pro triathlon season. I’ll also discuss what it will take for me to take triathlon from a glorified hobby to a viable career. I’m learning that skills like season planning, self-marketing and pathological cheapness frugality are just as important as swimming, biking and running to hack it as a triathlon pro. As always, my intent is to inform, perhaps to dispel some misconceptions and hopefully to entertain. The earnings prospects for a rookie pro triathlete fall somewhere in between “unskilled illegal immigrant” and “preteen babysitter”. Even established pro triathletes can struggle to make ends meet and the vast majority have alternate sources of income besides prize money and sponsorship. I work part-time as a consultant for a boutique environmental consulting company. I do all my work from home, the hours are flexible and my boss is a fan, which makes it a pretty sweet sideline for a pro triathlete. Last year, I was pleasantly surprised to earn enough from triathlon to cover all my triathlon-related expenses and squeak into the black. I’m sure that the numbers in this post will trigger mixed responses. Some of my six figure friends may raise an eyebrow. Others may be impressed that I managed to earn any money at all by running around in spandex. That’s closer to my attitude. I not only avoid any debt, but continue to save and invest. In my typical fashion, I carefully tracked every cent I earned or spent related to triathlon. A breakdown of my triathlon finances last year is below (in Canadian dollars at past exchange rates). This budget strictly includes triathlon-related revenue and expenses, and not my day job income or living expenses. It also omits extra food costs associated with burning twice as many calories as a NARP. The biggest unaccounted “cost” is hypothetical lost income from working far less than full-time at my job, which would run well over $50,000! See the end of this post for some additional comments. I buy the majority of my non-sponsored gear used and rarely buy the latest model. I arrange homestays at races whenever possible. In fact, I only paid for a hotel room once last year, which I shared with two other pros and a friend. It was cozy. I borrow my parents’ Toyota Prius and hypermile my way to most of my races, getting 4-5 L/100km (50+ mpg). I also carpool with other athletes whenever possible. When I must fly, one of my sponsors, Keystone Communications, generously helps me out. I spend next to nothing on healthcare, massages or other physical therapy. I pack food while traveling, shop at grocery stores and avoid restaurants. I can practically count on one hand the number times I ate out last year. Since a lot of my revenue and expenses are in US dollars, I have a US checking account and credit card, which saves currency conversion fees and hedges against currency fluctuations. All in all, my rookie pro season went about as well financially as I could have hoped. For some context, consider that there are probably under 100 long course pro triathletes earning more than $50,000 annually from the sport (by most estimates I’ve heard). Of course, I still have a long way to go to make a living at triathlon. More on that next. 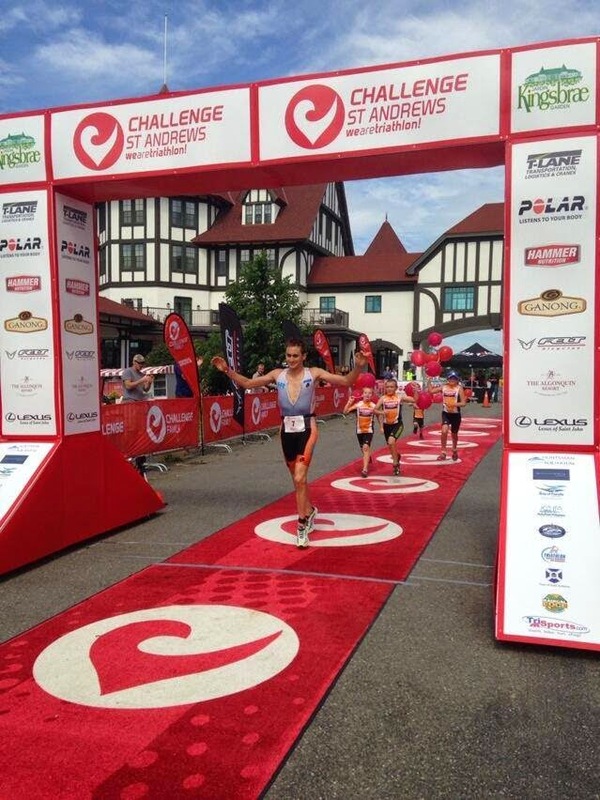 Challenge St. Andrews was far from my best performance, but it happened to be my biggest payday. My cost of living and all other non-triathlon expenses currently amount to $8-10,000 per year. This is ridiculously low partly because I rent a small loft in rural Ontario from some very reasonable landlords—my parents. Between rent and food, I spend about $600 per month. Apart from triathlon expenses, I spend next to nothing on entertainment, travel or shopping. Some of my cost cutting measures are extreme by my peers’ standards: I don’t own a car or cell phone, I rarely drink, and I keep the hookers and blow to a bare minimum. Nobody said pro triathlon was glamorous! I’m considering some major changes over the next year or two, such as spending a lot more time in The Woodlands, Texas where my coaches are located. Longer term, I have a fantasy of buying some land and designing and building a tiny house. 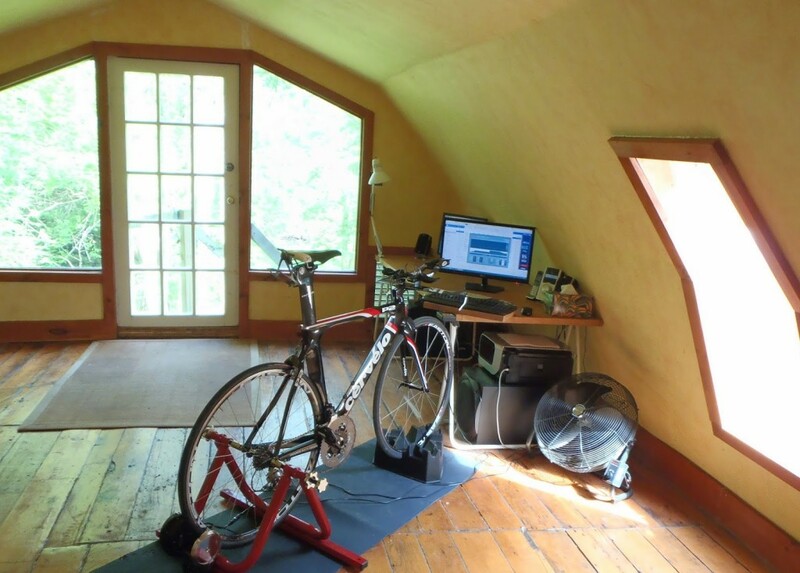 My loft, home office and training studio. What will it take to “make a living” from triathlon? Here’s a rough estimate of what it will take to make a very modest living as a pro triathlete, at a minimum. If all goes well in 2015, I hope to approach this range while continuing to earn some money from my consulting work. Like I said, I will not allow triathlon to become a financial drain and limit my future opportunities. My goal is to not only continue to support myself, but also to save some money every single year. For now, I think $5-10,000 is a reasonable goal that I’ve been able to meet. I’m a reluctant investor, but I force myself to sit down for a few painful days every year and research investing until I can’t see straight. Then I prod some money around and happily forget about the markets again for several months. Maybe you’re still wondering how a semi-employed recent graduate and would-be pro triathlete is debt-free. In short, I managed to more than cover my tuition and living expenses throughout university with scholarships, and invested every spare dollar near the bottom of the recession, when even a clueless investor couldn’t screw up. In case I’m sounding clever, remember that I’m now pursuing a “career” that will net me a lower hourly rate than a cashier at Walmart for the foreseeable future! This post wouldn’t be complete without a word on sponsorship. The most successful pro triathletes make a good chunk of their income, if not the majority, not from prize money but from sponsorship (including endorsement deals and appearance fees for the upper echelons). In-kind/product sponsorship is much easier to come by than some form of financial support. You can safely assume that most lower level pros never see a cent from the companies they endorse, or at least much less than you may expect. Product sponsors are important and valuable, but they don’t pay the bills. 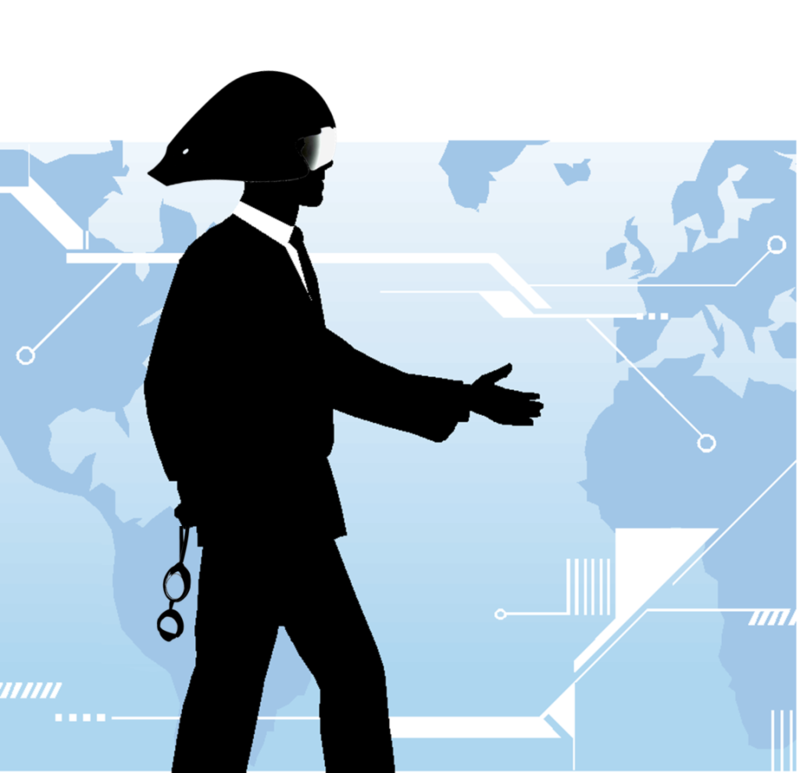 Acting as your own agent and negotiating financial support is fraught with difficulty and awkwardness. But the most important lesson that I’ve learned lately is that if you don’t ask, you don’t get. Financial support more often takes the form of performance bonuses, referral bonuses (i.e. kickbacks on sales generated by the athlete) or a travel allowance as opposed to cold, hard cash (i.e. a stipend/salary). None of my 2014 sponsorship agreements included bonuses, but this will be a new revenue stream in 2015. Some people assume that finding sponsorship is all about results. Others insist that “results don’t matter” and that other factors like social media are more important. I have found that the reality is usually somewhere in between. Most sponsors are looking for the full package when they partner with an athlete: profile, results, potential and reputation. In general, results seem to open the door to higher levels of sponsorship, but other assets help close deals. From observing other pros, I know that my first professional win will boost my sponsorship prospects. Keystone was one of my first supporters and continues to play an important role in my career. Roughly half my prize money came from a 2nd place at one race and 70% came from two races. This illustrates the importance of prize purses that are not overly top heavy, carefully choosing your races, and sometimes just getting lucky. Two unfortunate DNFs at local races likely cost me $1,000. Flat tires and wrong turns are the cost of doing business! Prize money won by foreign athletes at Ironman races in the US is subject to a whopping 30% tax withholding. A little known fact is that pro athletes, classified as “public entertainers” in the US-Canada Income Tax Treaty, are exempt from foreign tax on up to $15,000 of foreign income. This is more than the majority of pro triathletes can expect to earn in foreign income. Money paid to Uncle Sam can supposedly be reclaimed when filing taxes, but it is never cash in hand. I feel that the WTC’s policy of automatically deducting 30% on prize money payments to foreign athletes better serves their tax interests and than the interests of pro athletes. There is a huge range in how promptly race organizers pony up prize money, from cash-stuffed envelopes on the podium to delays of many months. Ideally, prize money would be paid the instant any doping test results were available, to limit cash flow problems. Apparently you can’t cash an oversize novelty check!